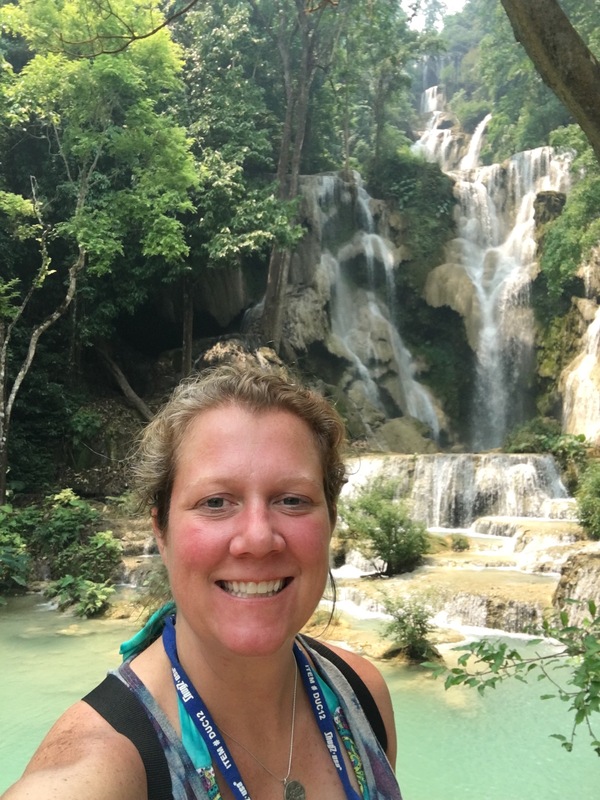 Magical Waterfalls and Jungle Fun! Yesterday was a magical day spent with my new friends Bryan and Triann from Saskatchewan. We met in town and caught a tuk tuk to the Kuangsi Waterfall Park. We arrived early, so there were very few people. 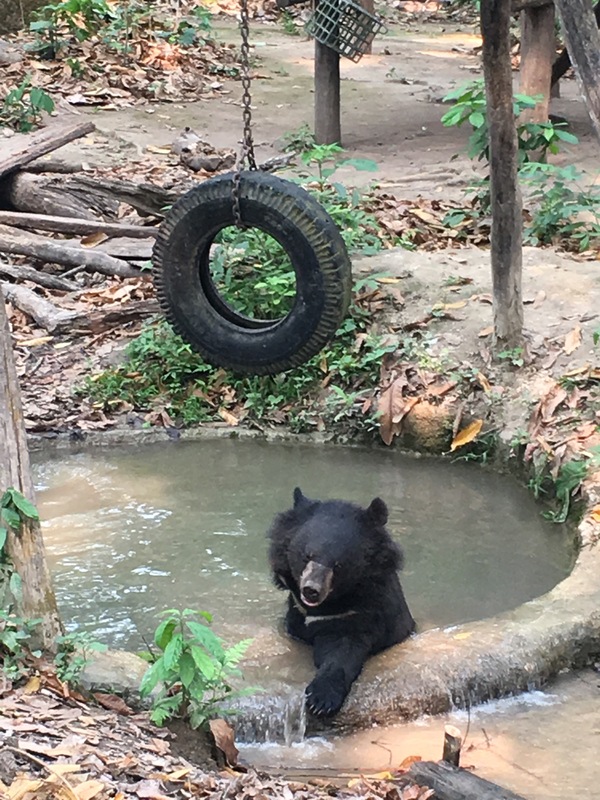 We began the hike up the trail, beginning with a bear rescue where they have taken in many injured sun and moon bears. They were so fun to watch as they played on their hammocks and bathed in their pools. We continued on to find a series of the most amazing waterfalls and bright blue water. It was surreal! 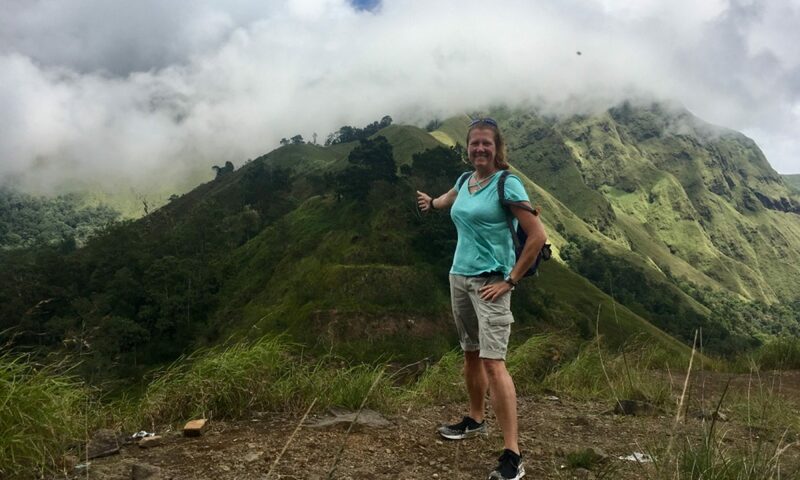 We stopped in several spots to take it all in and enjoy not only the falls, but the beautiful butterflies that were the size of small birds. When we reached the top of the falls, there was a sign for a cave and a spring 3km up the hill, so we hit it! 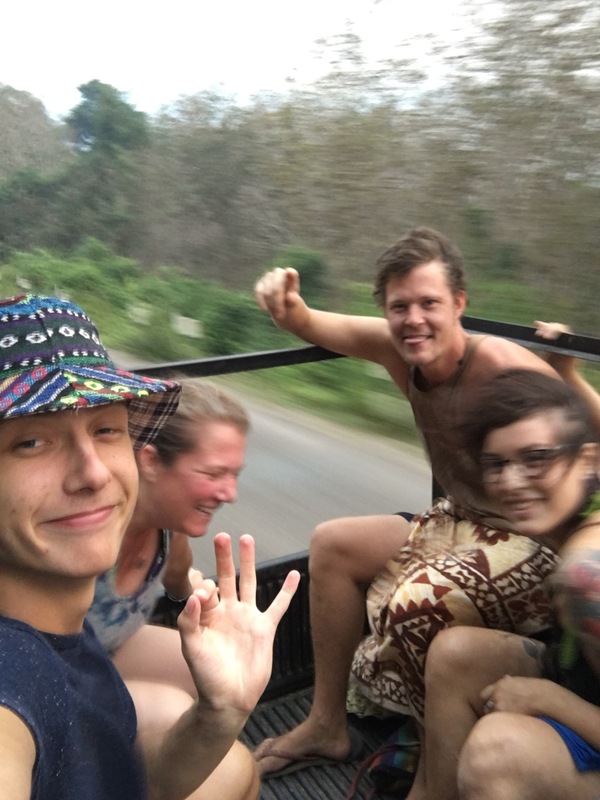 In the jungle, we picked up a new friend, Olle from Norway. He quickly became part of the group and we trekked on. When we reached the cave, we were given a flashlight and two bananas….I guess we looked hungry! 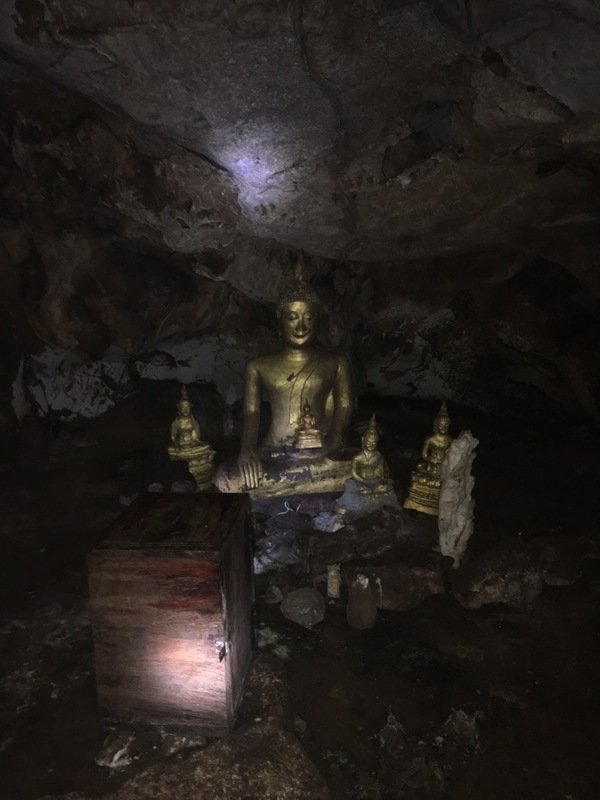 We walked several hundred meters into the dark cave to find amazing limestone crystals and a many Buddha statues placed in the caverns. It was so cool to explore! Next, we took the trail to the spring where we found a friendly local husband/wife who were cooking lunch and heading up some jungle games. It was somewhat of a mix between Ninja Warrior and Wipeout. 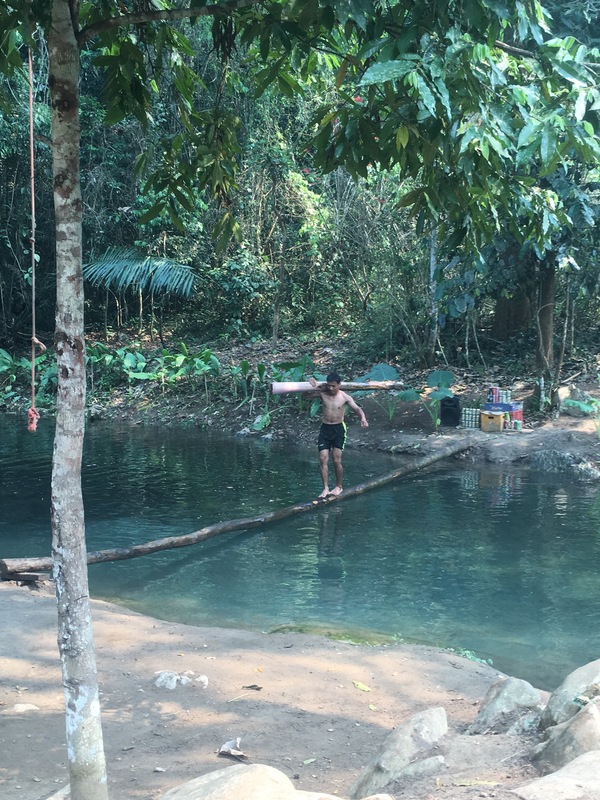 The first challenge was a walk a Beerlao bet on walking across a log bridge…you make it free beer, you fall in the spring, you buy the beer. 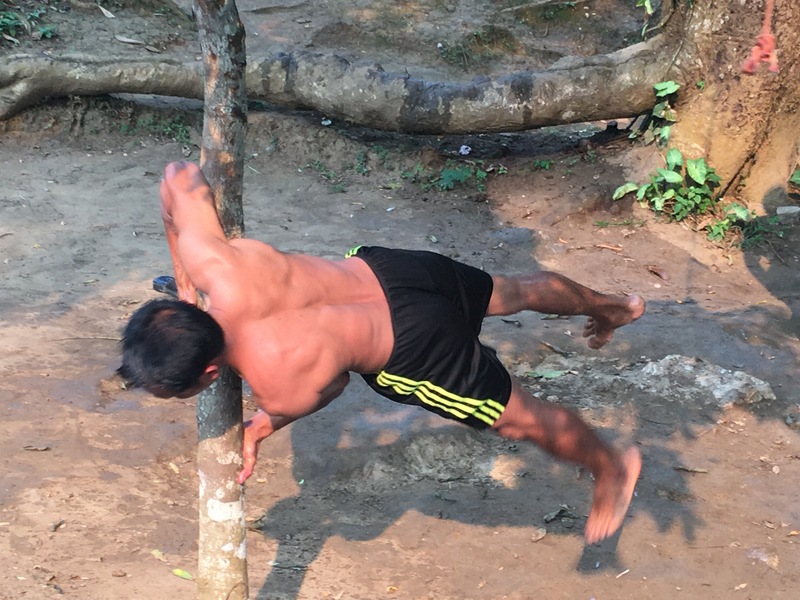 He made it look so easy…. After messing around and taking a swim, we had some amazing fried rice followed by more games. Just some good jungle fun! As we hiked down, the sun was going down and we stopped at the lower falls for a swim and a great waterfall massage. The perfect way to cool off! The evening ended with strolling through the night market, running into some friends from the slow boat and a couple of glasses of wine…..interrupted by a brief electrical storm which unfortunately collapsed the market and took out much of the power in town, but all ended well. Everyone pitched in and life is good!